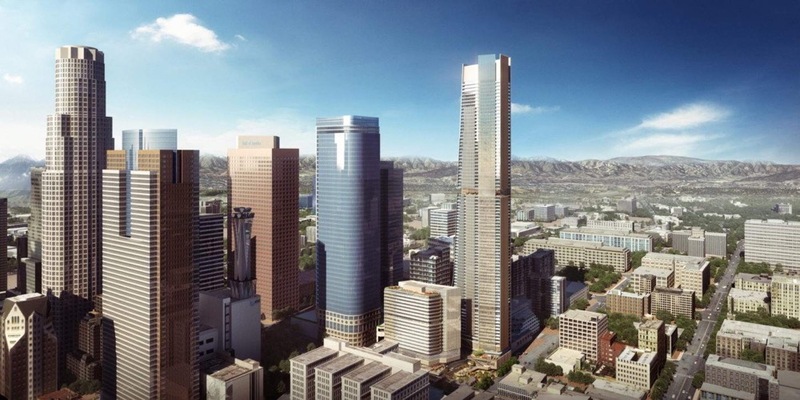 A proposed Handel Architects–designed supertall tower complex headed to the coveted Angels Landing site in Downtown Los Angeles has received a significant haircut. As a result of the revisions, the project will lose its supertall status (taller than 300 meters or 984 feet), but will still rise to be one of the five tallest buildings in the city. The proposed changes come as the project moves through the environmental review process and were first reported by Urbanize.LA. The project is being pursued by a consortium of developers called Angels Landing Partners, a group that includes MacFarlane Partners, the Peebles Corporation, and Claridge Properties. The team, which includes landscape architects Olin, was selected in 2018 from among four competing bids as part of a public competition. Originally proposed with a pair of mismatched towers rising 25 and 88 stories, respectively, the latest version of the project calls for a more balanced approach: Two interconnected towers rising 48 and 64 stories, respectively. Included in the project are 180 condominiums, 261 market-rate and affordable apartments, 509 hotel rooms, and approximately 75,000 square feet of commercial and flex spaces. The project is expected to include an elementary school as well as nearly 57,000 square feet of public open spaces. Despite being located above a subway stop, the project is slated to bring 750 parking spaces to the site. A new diagram for the project included in a draft environmental report shows that each tower will contain commercial and public spaces along the lowermost levels, with hotel levels rising above. The hotel programs will be capped by amenity floors with condominiums or apartments located on the uppermost levels of each tower. The proposal is among several tower schemes announced over the last two years that seek to reshape the Los Angeles skyline. Some of the planned projects include a 52-story stacked block tower by Gensler, a potential 1,100-foot-tall tower by Dimarzio | Kato Architecture, and a 70-story Redwood-inspired tower by Australian firm Koichi Takada Architects. The draft report states that the Angels Landing project is slated to finish construction by 2028. 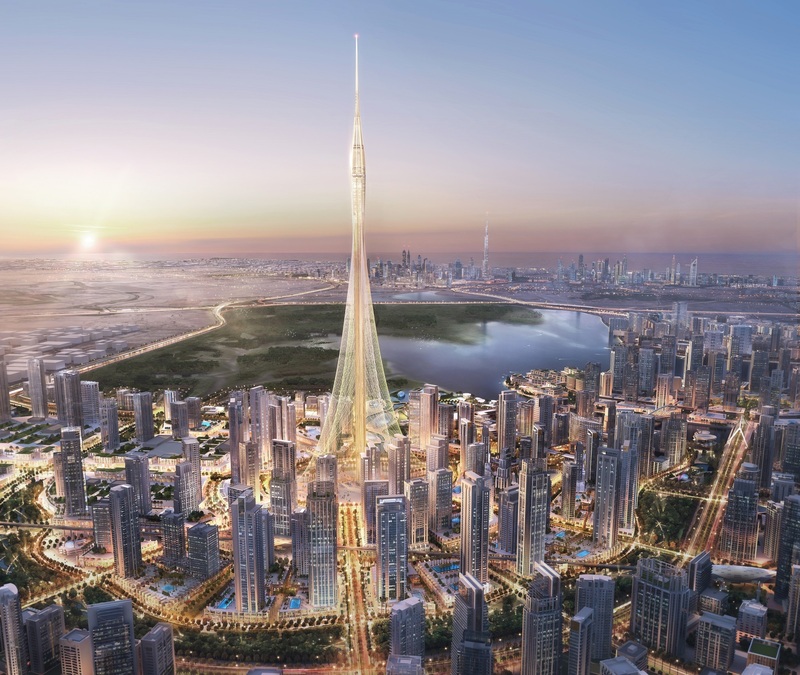 Not content with only 13 supertall towers, including Santiago Calatrava’s 3,000-plus-foot-tall Dubai Creek Tower, the state-owned Dubai Holding has revealed plans for the 1,804-foot-tall Burj Jumeira. The split-volume tower, which will feature a large void between its two curvilinear masses (resembling an elongated take on Zaha Hadid Architects’ Macau Hotel), will erupt from a pond emblazoned with the fingerprint of Dubai’s ruler, Sheikh Mohammed bin Rashid al Maktoum. The Burj Jumeira, not to be confused with the nearby Burj Al Arab Jumeirah hotel, will be springing up in a new mixed-use neighborhood in Dubai’s Al Sufouh area. “Downtown Jumeira” will hold a mix of residential, office, and commercial buildings, hotels, an amphitheater, space for artists and cultural events, and, judging from the video released by the Dubai Media Office, a fountain inside the fingerprint pool. The tower itself, whose design was reportedly inspired by shifting sand dunes, will be wrapped in an enormous digital screen capable of lighting up the entire building. A sky lounge and restaurant will round out the 360-degree observation deck planned at 1,476 feet up, and the tower is expected to be a major draw for tourists. ﻿ The reveal comes before the World Expo 2020 Dubai, as the United Arab Emirates city ramps up its architecture bona fides, an effort that created the world’s largest picture frame. Work on the Burj Jumeira began on January 31, the same day it was announced, and Dubai Holding expects the first phase of the project to be complete in 2023. No cost projection has been released yet, but the New York office of SOM will handle the tower's design and engineering, as well as the development of the Downtown Jumeira master plan. Move over 432 Park Avenue. In conversation with the New York Times, prolific developer Harry Macklowe revealed that he had filed a preliminary application with the NYC Department of City Planning for a supertall skyscraper in East Midtown that would reach 1,551 feet. That would make it the second-tallest in the city and the hemisphere after One World Trade, which reaches 1,776 feet. Tower Fifth, set to rise directly across the street from St. Patrick’s Cathedral on Fifth Avenue between East 51st and 52nd Streets, is, as the Times notes, likely to be Macklowe’s last great building. He has plenty of projects under his belt. The 82-year-old developer was behind the rise of 432 Park Avenue—the city’s current second tallest building at 1,396-feet-tall—the glassy Apple Store cube on 5th Avenue, and the renovation of the General Motors Building directly behind it, but Tower Fifth will require a slew of special permits, zoning permissions, and permission from the Landmarks Preservation Commission. The tower, if built as proposed, would be 66 percent larger than the zoning for the neighborhood would permit. The 96-story office tower, a joint effort between Gensler and local firm Adamson Associates Architects, is facing complicated siting conditions and is currently planned to cantilever over two separate landmarked buildings. According to the Times, Tower Fifth would hang 100 feet above the modernist Look Building at the corner of Madison Avenue, and 300 feet above the John Pierce House. An 85-foot-tall, marble-clad glass lobby would frame views of St. Patrick’s, while the tower proper would step back from the base and only begin to rise 400 feet above the ground. The Times notes that the tower will rise on two shafts or stilts. 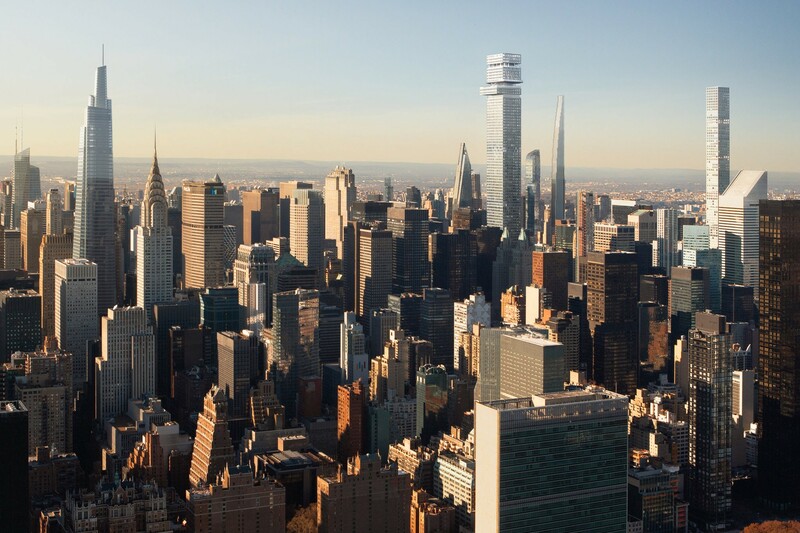 The massing of the tower seems similar to that of the rectangular 432 Park Ave., until reaching the top, where Tower Fifth will displace and cantilever its floor slabs, a move similar to Herzog & de Meuron’s 56 Leonard downtown. Macklowe also revealed a slew of amenities and promised that the tower's perforated facade would be extremely energy efficient. 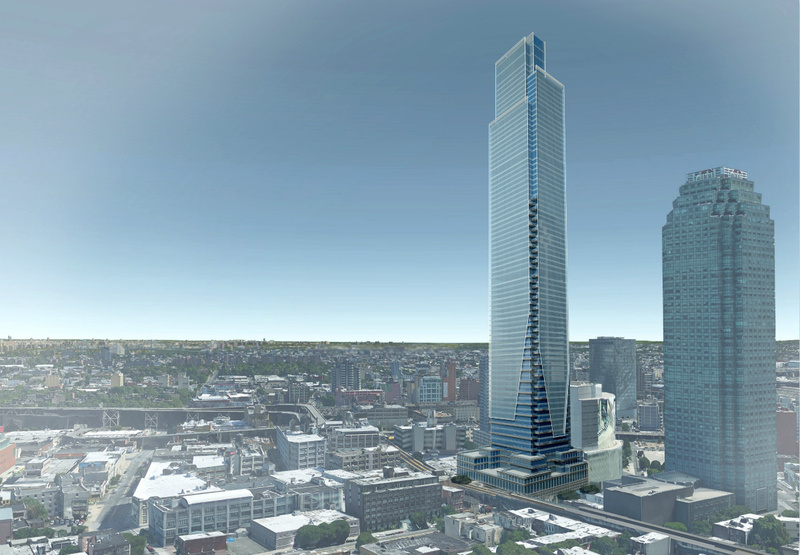 The city’s tallest observation deck (Tower Fifth’s roof would rise above that of the 1,776-foot-tall Freedom Tower), a 60-foot-long corkscrew slide, multi-floor running track, and a glass-faced public auditorium that would sit above the lobby and look out over St. Patrick’s Cathedral have all been proposed. 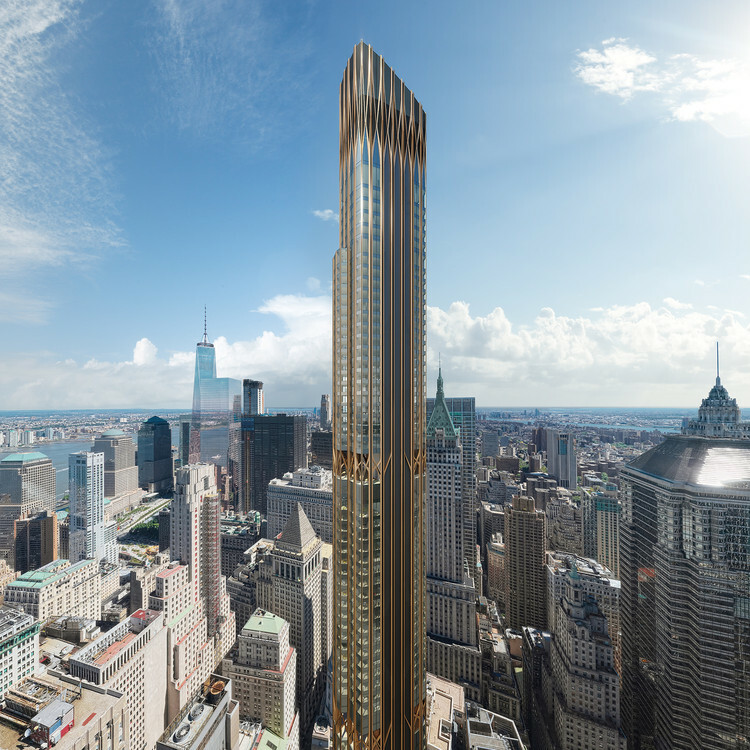 If Macklowe is serious about assembling the development rights necessary for Tower Fifth to reach 1,551 feet, the Times notes that he still needs to buy 580,000 square feet of air rights. While St. Patrick’s Cathedral has been looking to sell its unused development rights to fundraise for its maintenance, it remains to be seen if the owners of the Look Building and John Pierce House will be amenable. Adrian Smith + Gordon Gill (AS + GG) has revealed renderings for what will be the tallest building in China and the third tallest in the world when complete. The Shenzhen-Hong Kong International Center in Shenzhen is slated to rise to about 2,300 feet in a new development that AS + GG is also master planning. The Shimao Shenzhen Longgang Master Plan will be a mixed-use district with residential, hospitality, office, and retail space along with public landscapes and entertainment facilities. The Shenzhen-Hong Kong International Center symmetrical, vaguely biomorphic, glass-covered design is relatively similar to the firm's other work. AS + GG has designed many of the world's tallest buildings, including what will be the tallest building in the world when complete, the over 3,000-foot-tall Jeddah Tower in Saudi Arabia. Adrian Smith, cofounder of the firm, also worked on the world's current tallest building, the Burj Khalifa in Dubai, while he was still at Skidmore, Owings & Merrill (SOM). Assuming the Shenzhen-Hong Kong International Center is completed before another taller tower can be announced, when the tower is finished Smith will have worked on the three tallest buildings in the world. The building is tall enough to exceed the supertall tower range (which ranges from 984 feet to 1,969 feet), and to make it into the elite megatall crew, of which the Burj Khalifa was the first member in 2010. The current tallest tower in China, Shanghai Tower, designed by Gensler, is just over 2,000 feet tall. Apparently, Star Trek had it right. Those familiar with the seminal sci-fi series will find the thyssenkrupp MULTI system eerily familiar. Like the ubiquitous turbolifts of the interstellar television show, MULTI is a rope-less, sideways-moving elevator system. Thankfully, we don’t have to wait for the 22nd century to see them in action, because thyssenkrupp has a working prototype in the German countryside. The nearly completed thyssenkrupp test tower in Rottweil, Germany, stands 800 feet above a rolling green landscape. Essentially a complex elevator core, the test tower will have a full working version of MULTI. At the same time thyssenkrupp puts the final touches on its testing facility, MULTI already has its first client. 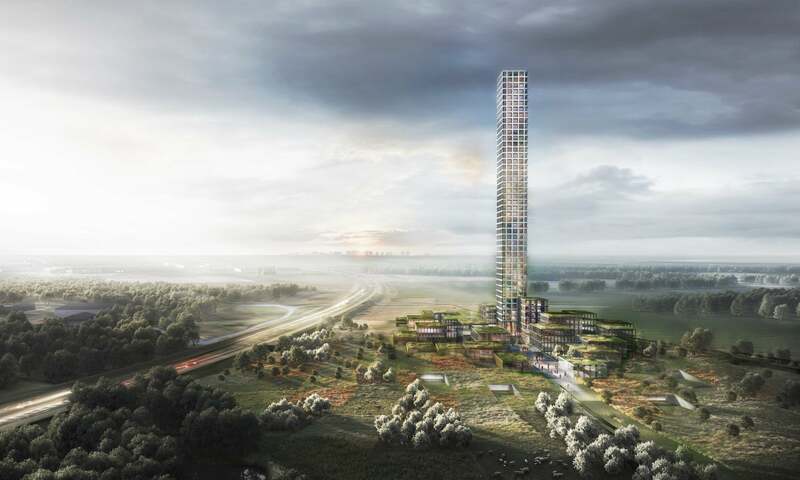 OVG Real Estate’s East Side Tower in Berlin will be the first to deploy the system. Unlike nearly all elevators, MULTI functions on a system of rails rather than ropes or cables. This has a distinct number of advantages, especially when building supertalls. The simple weight and length of the cables is prohibitive, and they limit the directionality of the elevator car. In general, only one car is able to be in each shaft at a time—a problem for buildings with tens of thousands of people moving up and down every day. MULTI, on the other hand, circumvents many of these obstacles. With no cables, multiple cars can move in a single shaft. The track system can be used to move cars up and down, as well as side to side. Working in loops, MULTI has the potential to be faster, and more efficient, both spatially and environmentally. Notably, while addressing many of the common issues facing current elevator technology, MULTI has one more advantage: There is no limit to the height or length of the system. While elevators are often cited as the invention that permitted the rise of skyscrapers, today supertall buildings are reaching the limits of that technology. The real question now, though, is: How are the buttons going to work on an elevator that can go in so many directions? Downtown's tallest residential building has a new face. 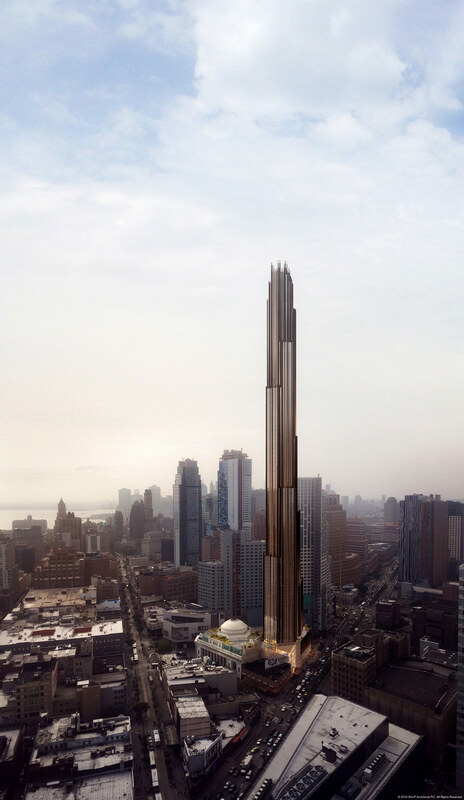 Renderings from the initial reveal two years ago depicted a normie glass stalagmite, but now the 1,115-foot-tall skyscraper in Manhattan's Financial District has a filigreed bronze exterior that references the city's art deco cloudbusters. With its expressive exterior detailing and floating floor plates, the CetraRuddy-designed supertall at 45 Broad Street shares a litter with Rafael Viñoly's 432 Park, as well as SHoP's 9 DeKalb Avenue in downtown Brooklyn and Morris Adjmi's Nomad tower, both of which were inspired by classic New York skyscrapers (there's a little Mark Foster Gage–y flair for good measure, too). Although the enhanced exterior renderings were released in October, this week YIMBY revealed new images of the mechanical floors that will double as observation decks. There will be a wind break on the 43rd floor, with another 16 stories below, and both of these spaces will have 32-foot floor-to-ceiling heights. A mass damper crowns the tower on its 64th floor, stabilizing more than 407,000 square feet of residential space over 206 units. On the lower floors, 62,000 square feet of commercial space and an almost 94,000-square-foot school round out the program. Construction is expected to wrap in spring 2021. 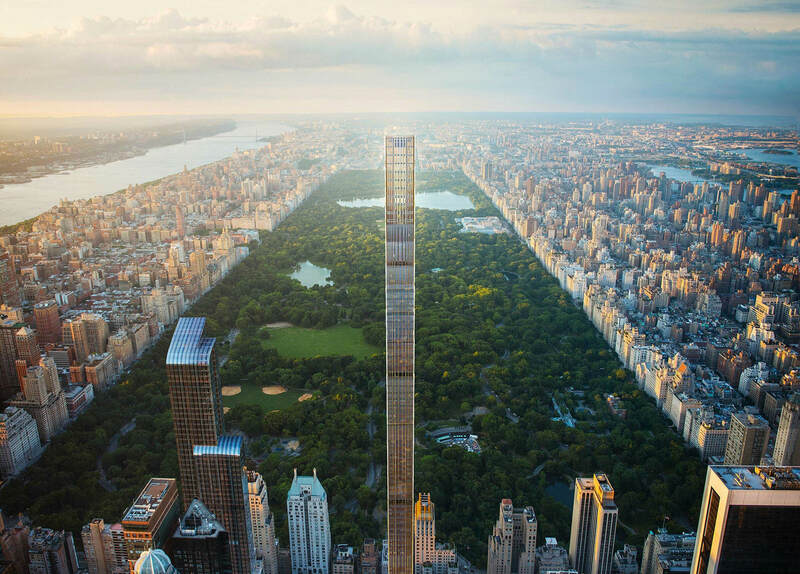 Faced with enormous budget costs, the world’s skinniest skyscraper on Billionaire’s Row in New York City could be headed towards foreclosure, the New York Post first reported. The SHoP-designed building on 111 W. 57th Street has only been built up to 20 stories and is already $50 million over budget. Real estate investment corporation AmBase filed a lawsuit in the Manhattan Supreme Court against the project’s developers and the lender over construction cost overruns. AmBase, which had invested over $70 million into the building, blamed sponsors Kevin Maloney and Michael Stern, as well as Spruce Capital Partners. “Apparently they omitted some very significant items in their budget including cranes, which are very expensive in New York and can run into the millions of dollars,” AmBase’s attorney Stephen Meister said to the Post. Maloney, Stern, and AmBase had defaulted on a $25 million mezzanine loan from Spruce Capital Partners in June, according to the Post. The proposed mezzanine loan would allow the lender (Spruce) to take control of the asset in a default situation. But on Wednesday, a judge enforced a strict foreclosure procedure, blocking Spruce from taking ownership of the project. If Spruce puts the building up for foreclosure, however, AmBase could potentially get back some of its $70 million investment. An earlier report by The Real Deal revealed that the developers were facing a $100 million cash deficit and that AmBase already sued the developers last year, alleging that they were trying to “dilute its stake” in the project. 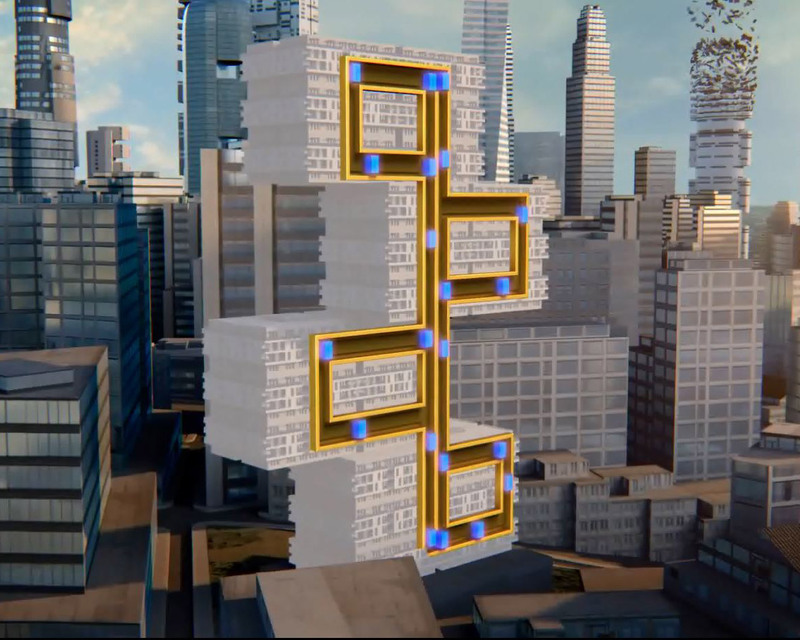 The building was meant to rise 1,400 feet, or 82 stories. It made headlines as the world’s most slender building, with a height-to-width ratio of 24:1 and a floor plate measuring 60 feet by 80 feet. 111 W. 57th Street is not the only building on the oversaturated Billionaire’s Row in trouble. A penthouse apartment at One57 on 157 W. 57th Street, the supertall that started it all, is awaiting its foreclosure auction. This article was originally published on ArchDaily as "CTBUH Crowns Ping An Finance Center as World's 4th Tallest Building." 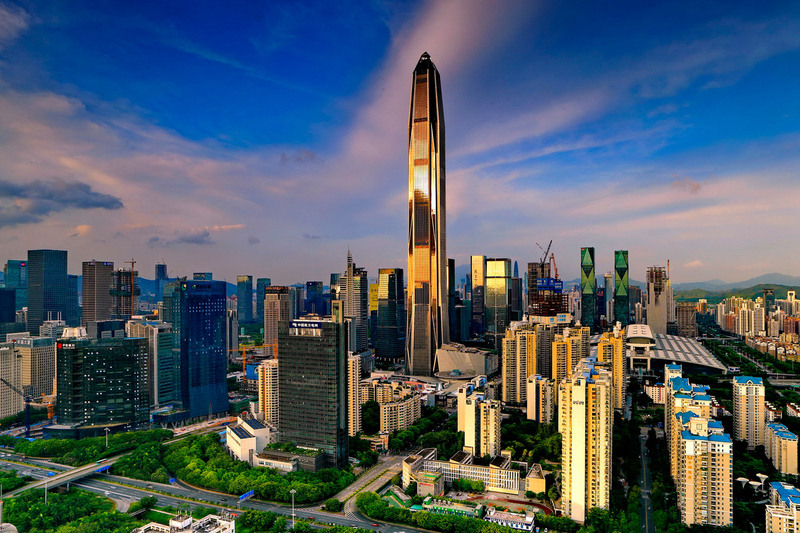 The Council on Tall Buildings and Urban Habitat (CTBUH) has announced the completion of the Ping An Finance Center in Shenzhen, China, according to CTBUH tall building criteria. At 599 meters (1,965 feet), it is now officially the second tallest building in China and the fourth tallest in the world, behind only the Burj Khalifa, Shanghai Tower and Makkah Royal Clock Tower. Designed by Kohn Pedersen Fox Associates (KPF), the Ping An Finance Center is located in the heart of Shenzhen’s Fuitan District. The building contains over 100 floors of office space located above a large public podium, with a multi-story atrium providing retail, restaurants, and transit options to the city and greater Pearl River delta region. The CTBUH describes the form of the tower as a “taught steel cable, outstretched by the sky and the ground at once. At the top of the tower, the façade tapers to form a pyramid, giving the tower a prismatic aesthetic.” The form is further emphasized by eight composite “megacolumns” along the building envelope that streamline the building for improved structural and wind performance, reducing baseline wind loads by 35 percent. The facade of the building is one the project most innovative features; its use of 1,700 tons of 316L stainless steel makes the envelope the largest stainless steel facade system in the world. The specific material was chosen for its corrosion-resistance, which will allow the building to maintain its appearance for decades even in the city’s salty coastal atmosphere. Read more about the project here. News via CTBUH. Written by Patrick Lynch. Want more from ArchDaily? Like their Facebook page here. This week in Dubai, UAE officials and architects from Santiago Calatrava's firm broke ground on what will be the world's tallest skyscraper. The Tower at Dubai Creek Harbour will rise 3,045 feet skyward when it is completed in 2020, at a cost of around $1 billion. 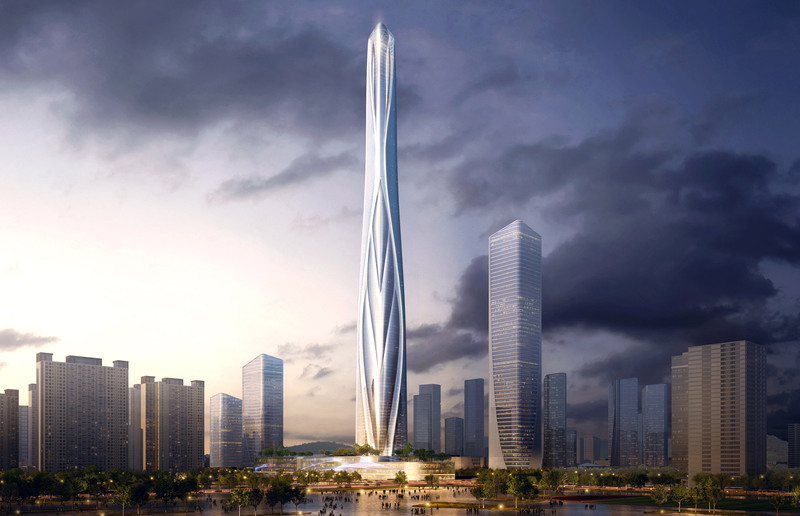 “The design and architectural features of The Tower demand unique engineering approaches that are currently being implemented on site," said Santiago Calatrava, in a statement. 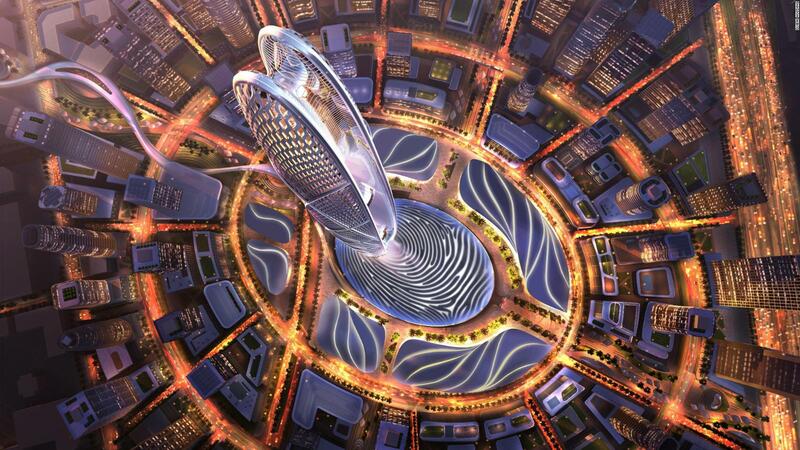 "Extensive studies were undertaken in preparation for the groundbreaking, and the learning that we have gained from the experience will add to the knowledge base of mankind.” Departing zero percent from the bells-and-whistles approach so common to UAE mega-projects, the tower combines traditional Islamic architecture motifs with Calatrava's signature white fish bones. Although renderings can deceive, the tower looks like Erte's Venere In Pelliccia traded her dress for one from David's Bridal, taffeta train and all. The fly-over animation below takes viewers up, through, and around the tower: https://www.youtube.com/watch?v=AC02sSzCAI4 Flashy amenities are key to this tower's appeal: Its pointy tip is devoted to something called the Pinnacle Room, a panorama viewing area that features VIP "garden decks," or observation platforms. These and other decks rotate outward, providing additional viewing points. In some ways, Calatrava's design recognizes the challenges of building densely in the desert: Water collected from the cloudbuster's cooling system will be recycled to clean the facade, while strategically placed flora will shield the building from the harsh rays of the sun. As a downtown anchor, the tower's main plaza will offer high-end retail (is there even another kind of retail in a project this size? ), education facilities, a museum, and an auditorium. SHoP makes the Brooklyn skyline with a “brooding, elegant, and badass” supertall… There goes the neighborhood? If you zone it, they will build, and they will build tall. New York–based SHoP, in partnership with JDS Development Group, revealed plans earlier this year to build 9 Dekalb Avenue, a 73-story, 1,066-foot-tall residential tower fused to the landmarked Dime Savings Bank in Downtown Brooklyn. Last month, the design cleared a crucial hurdle when the Landmarks Preservation Commission (LPC) approved the tower’s design and consequent modifications to the bank. “There’s a sort of brooding Gotham to it,” noted Gregg Pasquarelli, founding principal of SHoP. “There’s a little bit of badass to it, but it’s quite elegant at the same time. Isn’t that what we all want to be as New Yorkers?” The 417-unit building is clad in bronze, stainless steel, and stone, with view-maximizing interlocking hexagonal exposures. Pasquarelli explained that the facade detailing is such so that when two sides of the hexagon are viewed from an oblique angle, it will resemble one face, a sleeker reference to the grand old New York skyscrapers like Rockefeller Center and the Chrysler Building. Michael Stern, founder of JDS Development Group, proclaimed: “The tower will be Brooklyn’s next icon. Brooklyn was really missing that one iconic statement that was worthy of the borough. This building will really put Brooklyn on the map.” Drawing from the landmark on-site, the spacing of the tower’s vertical facade elements mirrors the spacing of the bank’s neoclassical columns. The color and materials palette picks up on the bank’s colorful stone interiors, which will be converted to retail, while parts of the bank’s roof will be used for the building’s private outdoor spaces. “The downtown rezoning of Brooklyn in 2004 has been very successful. This is a place where the city could handle density. It’s an incredible kudos to the city they upzoned that area, that they thought about tall towers,” said Pasquarelli. At the prow of Flatbush and Dekalb, the building will be visible from all over Brooklyn, and its distinctive facade will reinforce its prominent position on the skyline. Queens looks to be in line for it's first supertall skyscraper, situated on 23-15 44th Drive in Long Island City. Rising to 984 feet, the building will house 774 luxury apartment units inside 78 stories, as well as just under 20,000 square feet of retail and commercial space and 225 parking spots, located between the basement and second floor. New York practice Goldstein, Hill & West Architects are behind the project, which totals 969,000 square feet. With Midtown Manhattan less than five minutes away (by car/subway), the tower, known by its official name as "City View Tower," is in a prime location. Neighboring upmarket restaurants, the building is also joined by nearby Gantry State Park (which features a riverside esplanade, a fishing pier, and a playgrounds), and a host of art galleries, notably the MoMA PS1 and Sculpture Center. Other transportation links include walkable access to the East River Ferry and the Long Island Rail Road. Originally, development firm United Construction and Development had planned for a 963-foot tower, however, a 21 foot increase allows the skyscraper to be classified as a "supertall" due it being 300 meters (984 feet) or over. Due to a site elevation of 16 feet, the building will reach a height of 1,000 feet above sea level, and the project has to submit a request to the Federal Aviation Administration for approval to build. According to New York Yimby, plans are also progressing through the Department of Buildings with few alterations being made over the past couple of months. That said, they report a supposed increase of 114 from the planned 660 housing units listed on the developer's page. Ground is set to break on the project at some point next year with completion penned for 2019. Goldstein, Hill & West Architects also have another luxury tower in the making for the area. Located on 42-12 on 28th Street in Long Island City, the tower will be smaller than their "City View Tower" accommodating only 477 units, reaching 634 foot. Amenities are set to include a resident lounge, pool house, full spa and observation deck.